Fantastic Queen + Adam Lambert Review! You are here: Home / Tours and Live Performances / 2014 Queenbert Tour / Fantastic Queen + Adam Lambert Review! There have been so many almost-great reviews, but none of them have raved the way we fans know they should. Queen has been outstanding, and Adam Lambert has shown all of the doubters that he’s a powerhouse on stage. Here’s a review from serious fanboy Steven S Shaw for My Hyper Reality, that really brought satisfaction and peace to me. Let us know what you think too! I’ll start it below, but please click on the link for the whole piece. It’s filled with lots of great videos and pictures. And read some comments – you’ll be with your Glamily! 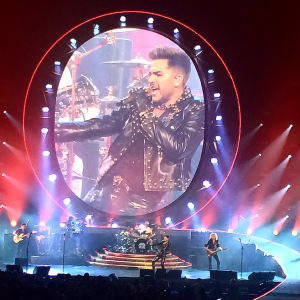 Concert Review: On Queen’s New Tour, Adam Lambert Steals the Stage! Could the man possibly get more gorgeous? Seriously he looks younger than when he was on Idol. Yeah, this one was amazing! Great review..thanks Carol for posting it. I guess the rest of the world is finally realizing what we have known all along. ADAM is the best!!!!!!! I did love this review. I’ve actually read a few more that were really awesome. Lyndsey Parker always writes great reviews of Adam and I wish I could remember a few more that were stellar. There are so many I can’t count. I leave comments at most of them. I think you’ll see my comments on this article. This tour has been better than awesome. I was at the Mohegan concert! I am a lifelong Freddie fan,and love Queen.Having seen Adam twice before I knew he’d be really good,but I have to say he reached a whole new level here.Absolutely amazing.If his new album has music along the lines of Queen;s songs(rock),I’m betting he will finally make it big with Amerian audiences and especially radio play. I am a 64 year old Adam Lambert fan & grew up listening to Queen & Freddie Mercury. Two weeks ago I went to the Dallas concert & really haven’t landed yet. Adam is truly just amazing & I have a new respect for Queen. I felt like a giddy schoolgirl when I left the concert. Amazing experience. LOVED IT! Funny, Carol and I were at that concert too with my sister-in-law named Jackie, who lives in Dallas! It’s a small world! I agree with all of you. Saw the show in Montreal…..
What a great review & great comments. Adam Lambert is a gift to the universe & all of us who saw what a great talent he was from the first moment we saw him on American Idol makes all of us Glamberts so proud to have been a part of his journey. Rock on Adam!!! !